I was interested in whether or not people actually watch videos that we (news people) post on Facebook. I had a feeling that videos get a lot of views because they are auto-played. Below are 4 videos I analyzed. It is a video we post each morning, and it recaps the morning’s top news stories. I think the problem is that these videos do not provide anything different from what you get on TV. After just 4 seconds, we lost 90% of the viewing audience. I went on to find that about 99% of the “views” from our morning sprint videos were auto-played. 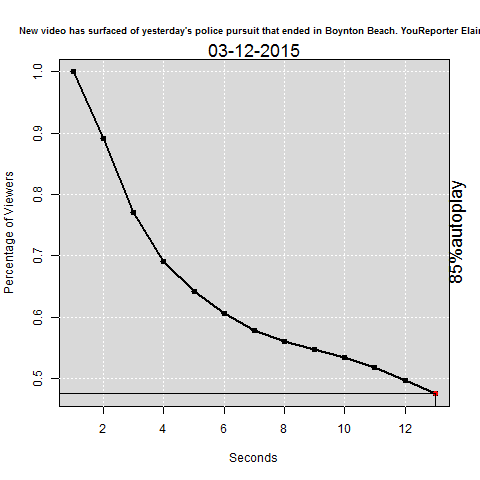 On the other hand, a video about a police chase had much better retention. Obviously, a local police chase is way more entertaining than the today’s-top-stories-snooze-fest. After 13 seconds, we still had half of the viewers. Not ALL videos are a total loss. 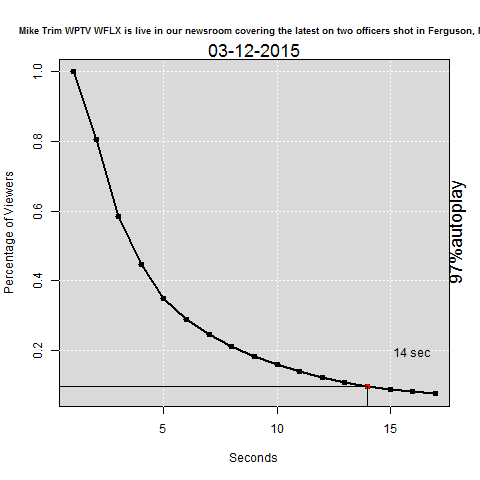 The update video we posted about an officer shot in Ferguson did alright, yet we still lost 80% of viewers after about 7 seconds. I went on to analyze 30ish of our last videos. Perhaps people would rather just read a news story? z &amp;amp;lt;- as.numeric(x[k]) #value of x that is closest to 0.10. This will be used in the plot. Nice code, but should I see code or the result? Charles, I wasn’t quite finished yet, but someone wanted to look at my code so I went ahead and posted it. I’m making changes now.